Alive with Alzheimer's is a collection of photographs in black and white by sociologist Cathy Stein Greenblat of residents, their caregivers and some friends and family at Silverado Senior Living in Escondido, California. Silverado is a specialized residential care facility for people with Alzheimer's and other forms of dementia, and there are now many such facilities around the country. Greenblat was especially impressed with Silverado because of their attitude towards their residents and their ability to improve their quality of life. Her photographs attempt to capture some of this. They also provide more positive images of people with Alzheimer's, helping to counteract the hopelessness that often accompanies a diagnosis of a neuro-degenerative disease. 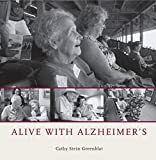 An introductory chapter explains Greenblat's personal interest in Alzheimer's -- some of her family members have had the disorder. She says that people with Alzheimer's are capable of living and loving, and they need loving attention. Other chapters have explanatory text accompanying the photographs, often with extended quotations from some of the people photographed and there is an Afterword by Enid Rockwell, MD, which sets out some of the basic medical information about the disease. It is a short book at just 116 pages, many of which have little or not text. Nevertheless, it is powerful and instructive. The profound and progressive cognitive deficits that come with Alzheimer's are frightening both for the person with the disease and for family members, who see their loved one disappearing as they watch. Memory-loss is a universal symptom, and people with the disease eventually stop recognizing their family members, or they revert to an earlier time in their memories, when their children were young and their spouses were still alive. People lose their other cognitive skills too, and in some respects become like young children. A considerable proportion of people with the disease experience delusions, and may hear voices. Greenblat's emphasizes that Silverado is special because it helps its residents retain their humanity rather than dope them up with lots of medication and stick them in front of a television. She shows residents enjoying themselves on a day trip at the horse races, at the residence with their family members, interacting with pets and children, playing games, and enjoying music. There is no denying that the residents shown are in advanced stages of their disease, yet they are often still capable of happiness and joy. While it can be very painful for family members to see their loved ones gradually retreating from the world, it is a comfort to see them still having some life. While Alive with Alzheimer's is inspiring, it is will not alleviate all fear of Alzheimer's. Facilities like Silverado are probably unusual and difficult to find. Furthermore, even when living as fully as possible with advanced Alzheimer's, one may question whether one would want to live like that. The suffering and loss that comes with degenerative diseases is terrible, and many people hope that they die suddenly, in their sleep, while still retaining most of their physical and emotional capacities. Seeing the disorder raises difficult questions about when life is worth living, and when life is worth ending. For those of us who still are still basically healthy, it is hard to contemplate such a decline. Greenblat's book does not make it much easier to think about the losses that come with Alzheimer's, but it does point to some ways in which living with those deficits may still be better than death.